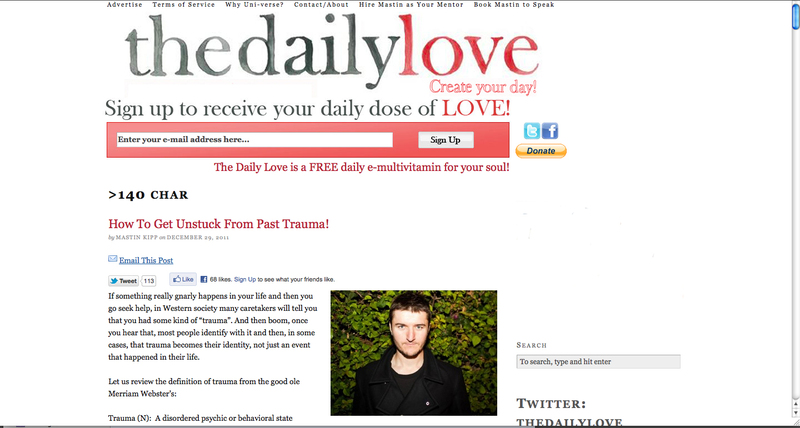 Chances are you may have heard of Mastin Kipp’s The Daily Love. You may even be following him on twitter. If you aren’t, you’re missing out! It was at the beginning of this year that I found out about Mastin and The Daily Love and I immediately signed up to get his daily email newsletters. I also started to follow him on twitter. I was drawn into the idea that he creates an inspiring theme, every day, that he shares with others. His goal? To encourage others to manifest their highest potential. Complete with thoughtful themes, inspiring words, conscious quotes, images and guest bloggers, one of my main attractions to The Daily Love, was that it welcomes readers with the aim to make them happy, so that you share this happiness with others. I’m on the same page and share the same goal. The same way I enjoy posting quotes on my Facebook page and sharing ideas, articles, and words with others, I enjoy sharing people with others! So, take a look at his website and I am sure you will come upon something that speaks to you and inspires your heart…daily.